It’s been a busy week! We are back to school and the first week is always hectic. On Monday, when I came downstairs, there was Davey waiting. He was jumping up and down. “Mommy, I get to spend the whole day with Daddy!” He was very excited about the WHOLE DAY aspect. They went to tumblin’ and to the mall playground. Luckily, they met me for lunch as well! I’ve not had much time to knit, and it’s just been pretty hot this week so I have not been able to knit on my wool/alpaca Girasole too much. It makes me sweat. I have high hopes that it is going to cool down soon, and then I will get back to that. In the meantime I’ve been making some leaf dishcloths. They go really fast and are made out of cool cotton. A friend told me about “I Love Cotton” from Hobby Lobby. I like it. It’s softer to work with then the Sugar ‘n Cream although I do like it too. I also like how the I Love Cotton feels after it’s washed. So that’s it on knitting. Not much time this week for that. Ok errand time. Davey loves for me to list off the errands we need to do. He also loves to go to the grocery store and once we have gotten everything, I have to list it all. Davey looks and says “CHECK!” for each item. He loves that. We are also going on a short trip, and Davey wants a new cd to listen to. He has made a list of the songs that he wants on it. His choices are influenced by the Just Dance game he was playing some. So he wants “Cotton-Eyed Joe (and he always enunciates the “ts” So it is CoTTon”), “Who Let the Dogs Out” (this is a favorite of David’s. – actually he can’t stand it, but Davey loves it), “Eye of the Tiger”, “Ring of Fire” and of course a little Gaga. I have to discuss the list with him again because I am forgetting a few songs. I haven’t taken any new pictures this week so I am putting up an old favorite. 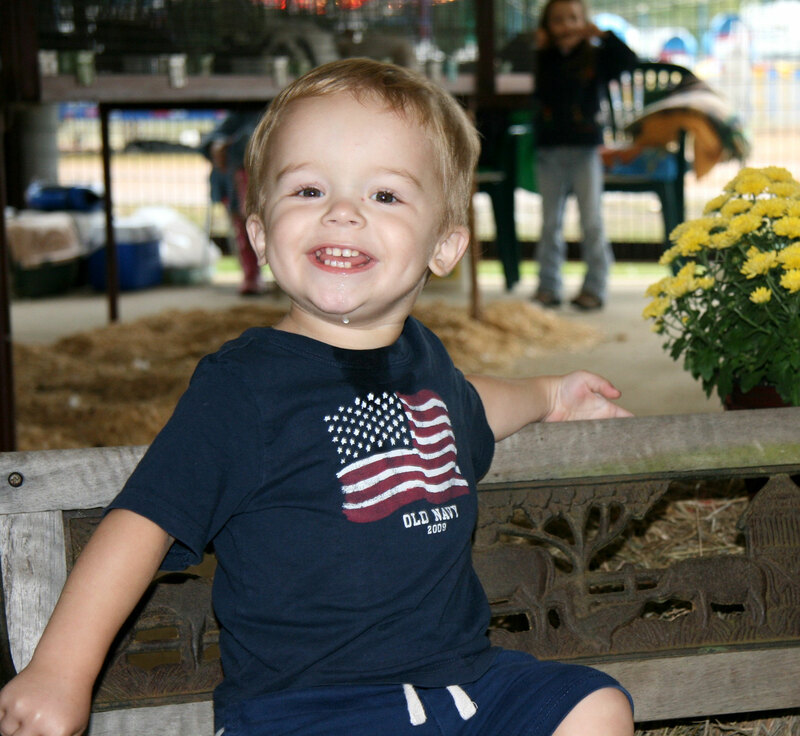 This was Davey at the fair in Arkadelphia in September 2009 – just about 2 years ago! I’m going to use that line from now on–You’re giving me a headache of that! Too cute! Look how much he’s grown!